It’s an “I Can Do It!” world. Well, don’t you believe it? OK, so that’s a bold statement. But just look around at this world! From cradle-to-grave, we are taught that we must depend upon our own strength to get things done! And we are told we must depend upon our own intellect to solve our problems! Yes, this is truly a Rosie-The-Riveter world in which the people attempt to live by their own strength and intellect, instead of trusting in God’s strength and His infinite intellect! 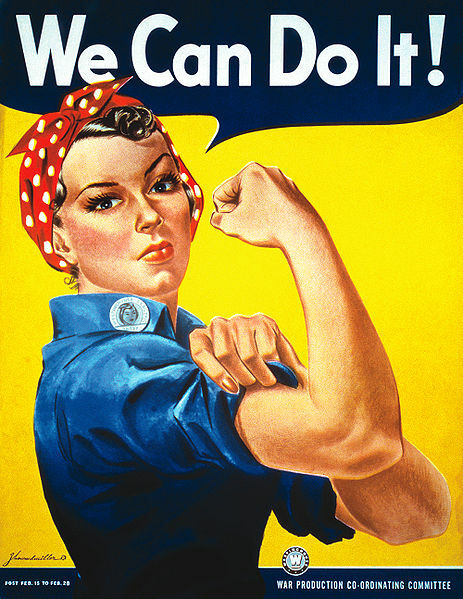 And it’s been a Rosie-The-Riveter world for a very long time! Even far back in the Garden, when the Tempter enticed the woman, it was concerning the issue of her wanting to be like God. She didn’t want to trust in God. Instead, she merely wanted to do things under her own strength and intellect. Yes, in a very real sense, Eve was the very first Rosie-the-Riveter! But God has called out a people to Himself. And an integral part of being a child of God, is to live by faith! Well, if a person would go to just about any pastor, and ask the question, “What is faith”, that pastor would direct him or her to Hebrews, Chapter 11. That chapter has been aptly nick-named, “The Hall of Faith”, simply because it is filled with various examples of Bible characters who lived by faith. Here is a concise, one-sentence definition of faith: to take hold of the things we know that God wants to give us, even before we actually receive them! But the next 39 verses go on to mention the different individual acts of saving-faith which were exercised by some of the most notable characters found in Scripture: Abraham, Moses, Samson, as well as many others. Schnorr von Carolsfeld – 1860 – Abram counts stars – Wikipedia – Public Dom. Now one of the great stumbling blocks that so often makes it difficult to live by faith, is that Satan has so completely immersed us in this faithless world to the point that our spiritual sensibilities have been greatly blunted! Here it is discovered that Satan greatly destroys our Christian virtues by merely encompassing us by unbelievers on every side. Because he fully understands just what a powerful influence our daily associations can be! Here again, God reveals the powerful influence of our daily associations. Yes, by carelessness in associations, Christians can actually quench the Holy Fire that burns within the soul! And before long they unknowingly begin to devolve down into the same faithless lifestyle of the world! But the Good News is, that it is still the day of Salvation! And we can begin to cry out for His Spirit of faith to burn brightly in our soul. And we can cease from our preoccupation with this faithless world, replacing it with the day-and-night contemplation of God’s Word’s of faith. And little-by-little, our faith will miraculously grow, as we increase from faith-to-faith! But upon a closer examination if you have access to a very dark sky out in the country; if you watch this wreath, you will eventually see 5 more very faint stars, making a total of 12 stars, plus that single star in the middle. This wreath now becomes a crown of 12 stars. This goes along with Revelation 12, which tells of a crown of 12 stars upon the head of the Virtuous Woman of Revelation 12. Just listen to Revelation… “And there appeared a great wonder in heaven; a woman…and upon her head a crown of twelve stars:” Revelation 12:1. But this crown is not yet upon the head of the Virtuous Woman of Revelation 12 Constellation (also known as Ursa Major). It is just above her head, as if she has yet to attain it. Of course, the 13th star in the middle would represent Christ (Who is our true Crown of our rejoicing). Ok, so we have a picture of Christ and His twelve tribes of Israel. But also we have a picture of Christ and His twelve apostles, which is a picture of His Church. So this heavenly crown is a multi-faceted concept. 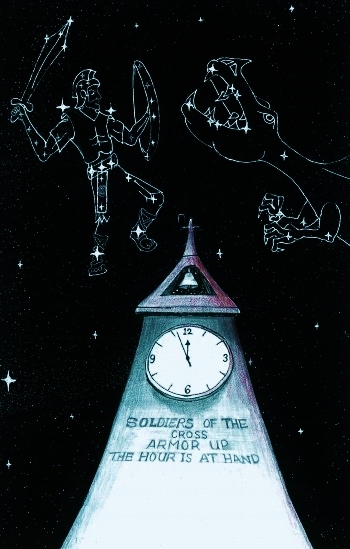 But as far as this article is concerned, the concept to remember is that this Revelation 12 Woman (Ursa Major) appears to be grasping for this 12-star crown. 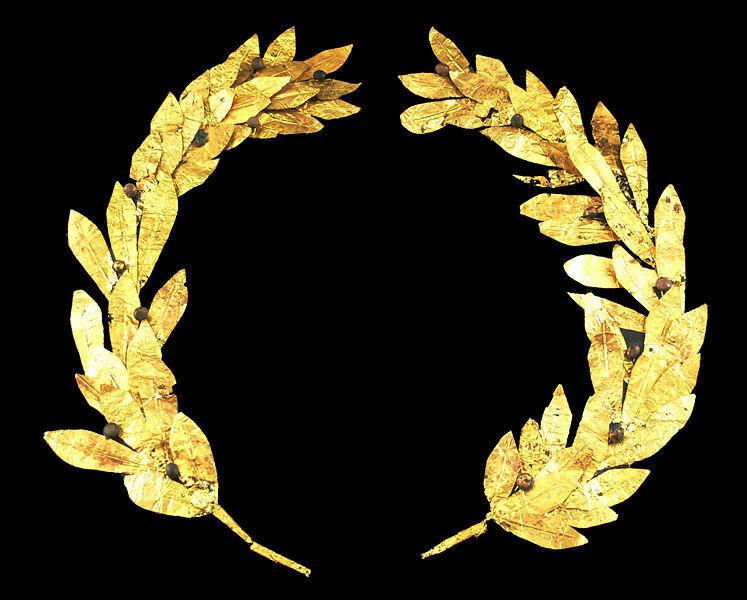 It represents the prize which God has promised to all who finally overcome the world. And so, with this in mind, one can see that there’s a prize to win: a glorious crown!